After a long time, probably after I read ‘The Life of Pi’, here’s another book which keeps you engaged till the end. Its a sad and tragic story of a boy from Afghanistan. Its a work of fiction by Khaled Hosseini and his first one, did this in 2003. He is from Afghanistan. The book starts with a story of a boy in Afghanistan in a well-to-do family with access to English DVDs, good food, Mustang, a influential father and most importantly a divine friend. The book is named ‘The Kite Runner’as this divine friend is a great kite runner. 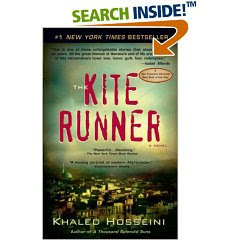 A kite runner is someone who runs and loots the cut kites. Amir, the rich kid and the Hasan the poor kid. The story moves easy and well in the beginning with details on Afghan life and mostly about Kabul before Russian war era. It all funny and good-read till Khaled makes the first blow where Hasan gets badly treated by a group of rowdy boys. Wont tell you the actual thing but I was very shocked and I actually stopped reading this for a while. It seemed like a big effort to again pick the book and resume. From then on the story turns and more tragic thing start to happen. Amir gets into that guilt mode since he could not save Hasan. Then the war happens and they have to flee to Pakistan and then later to US. Amir has lost his mother very early and his Dad was never too excited about Amir for he was more of a creative kind with little or no interest in sports or more manly occupations. The story then moves leaps n bounds with Amir finally moving to US, finishing his school there, finding a girl, comes back to Pakistan to meet an old friend of his Abba. Its a not a thick tome but Khaled has been able to add so much that you keep engaged and connected. Infact in last 100 pages, there are many new twists and discoveries. Its not only a story of a boy by now and rather takes you to society and a country. In last few episodes so much happen that you start to get nauseating at times. The finish line has not been decorated too much, it sorts of end on a subtle note. Nothing great happens in the end, probably a realistic end to a heroic story. If you dont like reading tragedies then avoid but if you are interested in reading human relations, those secret aspects of ourselves, the innates then do read. There is movie on the book and is getting released shortly so read the book first before watching the movie. Recently I wrote a review on ‘The Google Story’. Over last few weeks, I read ‘The Google Story’, yeah its an old title but Google is still hot I guess. Its very well written and reads like a fiction. I personally do not know much about David A. Wise, author of this book but a quick google search yields good results and after reading 2 minutes, it comes out that he has done big things to write home about. It happened in India is a candid and close book by Kishor Biyani, the king of retail as often called by lot many with every growing day. This book which is sort of a young biography of Kishore is co-authored by Dipayan Baishya. Kishore or KB as often referred to in the whole book starts with telling the Big Bazaar story esp the ‘Sabse Sasta Din’ campaign of 26 January 2006 and it reads like one hell of a fiction. I wont leak the story but how much you can imagine a grocery store can make by selling Atta, rice and low priced tops and jeans. They do sell TVs and Washing Machines but these are not the ones which get picked up in large nos. Ever heard someone who wanted to buy one AC, actually ended up buying three of them. This happens all the time for folks who go to Big Bazaar to buy a T-Shirt or a Juice can or even a shampoo. Coming back to fiction, the first story is very well sold to readers and that sort of binds you to read the remaining book. Some of the things which KB talks about are how there store are never a few steps up guarded by a inhibitive security person or on how not to have long aisles and how the concept of having mini-bazar is so much common sense. One of the things which everyone keeps telling us is that when WalMart or other such biggies come here with their expert inventory systems, people like KB will go bust. Well after reading it doesn’t seem like as KB tells us stories and stories on how we need to Indianize things. After the big bazaar story, KB tells us about his background, how his parent came from Bikaner and setup shops in Mumbai as traders. He is a Marwari like some of the other big businesses but he didn’t chose to do what his parents were doing. He dabbled in many things, from tailoring patlooons (yeah thats what it was called way back) to setting a fabric factory. You would be surprised to know that KB even produced a movie called ‘Na Tum Jaano Na Hum’ followed by another flop and decided to stop. He talks about the future and the ‘future group’. Pretty easy and good read for all. He finishes with another equally fascinating fiction which they pulled off next year on 26 Jan 2007.